In the last few weeks, we have been working on French classics. 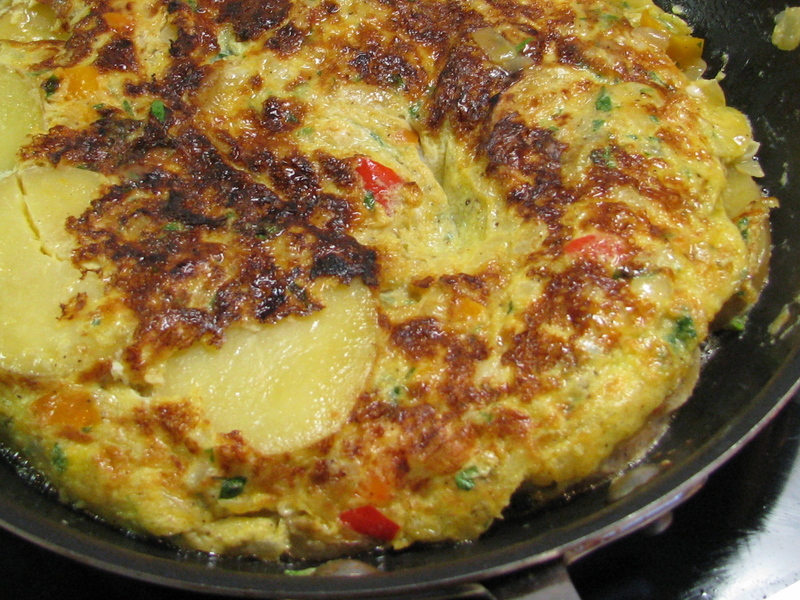 Let’s take a break this week and look at a great Spanish favorite – the tortilla Española. Wherever you travel in Spain, you will find this dish in every bar and restaurant. It is the epitome of ubiquitous. Tortillas are typically made in the morning since it is the most common Spanish breakfast, but enough is made so that people can order it for lunch or even as a tapa with drinks in the afternoon. Unless you get it early in the morning just after being prepared, it is served at room temperature. 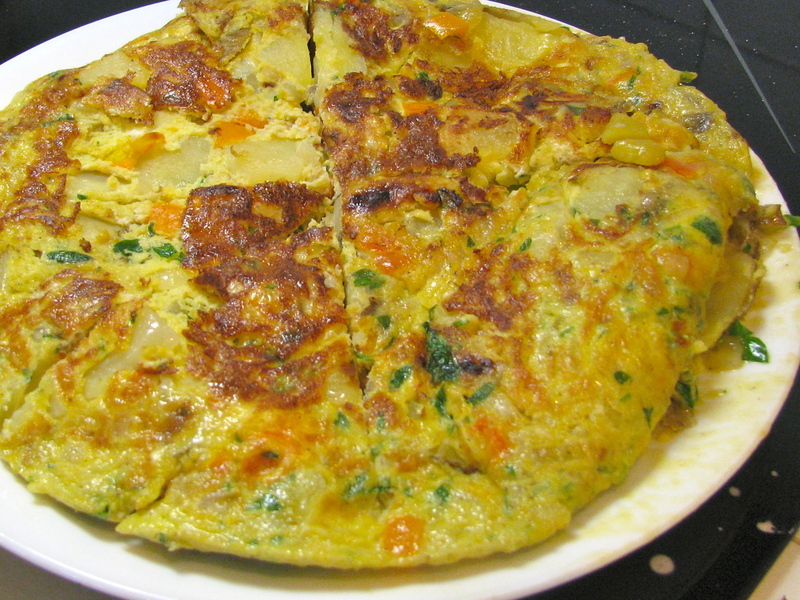 The dish is basically a thick potato omelet or a potato and egg pie. You can add things to the basic recipe, like roasted red peppers, or even a little ham (jamon Serrano) or chorizo. However, it is often prepared without any of these additions. We will start with the very basic recipe – you can experiment later. I do like to add a little crushed red pepper to perk up the flavor. Midway through the cooking process, you have to flip the tortilla. This is done with oven mitts and a plate that has a larger diameter than the 10” skillet you will be using. You put the plate on top of the skillet, grasp both plate and skillet with two hands and flip. On the plate, you now have a half-done tortilla, which you slide back into the pan to continue cooking. The flipping process is scary the first time, but it is really very easy. It is also very showy and will get some great reaction from the crowd. Needless to say, as a Bravado chef, you would only prepare this dish when there is a group of adoring fans present. We are not timid souls working quietly in the kitchen – we want the show, the accolades, and the banter. We are Bravado for a reason. This dish is a great opportunity to use your mandolin. This is a $20 item at Amazon (Progressive-International-HGT-11-Folding-Mandoline) and is BBG (Basic Bravado Gear). This little device cuts the prep time in half. You should have one. It is important to use a Spanish or sweet onion in the recipe. 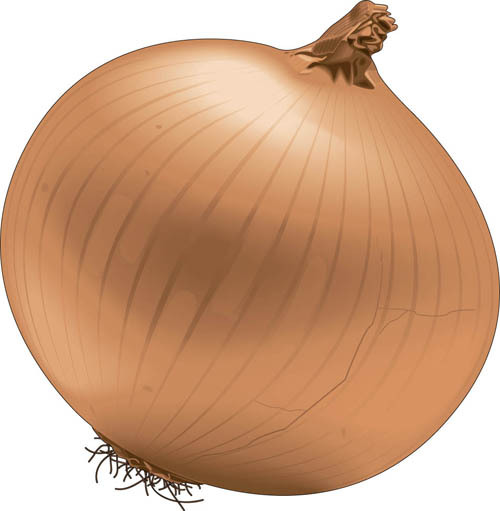 “A Spanish onion is a type of onion that is typically fairly large — about the size of a softball used in sports — and is yellow or white in color and fairly mild and sweet in flavor.” (www.wisegeek.com). It is similar to the Vidalia onions or the sweet onions from Chile. Heat the olive oil in a 10” non-stick skillet over medium heat. Sauté the onions and the crushed red pepper for two or three minutes. 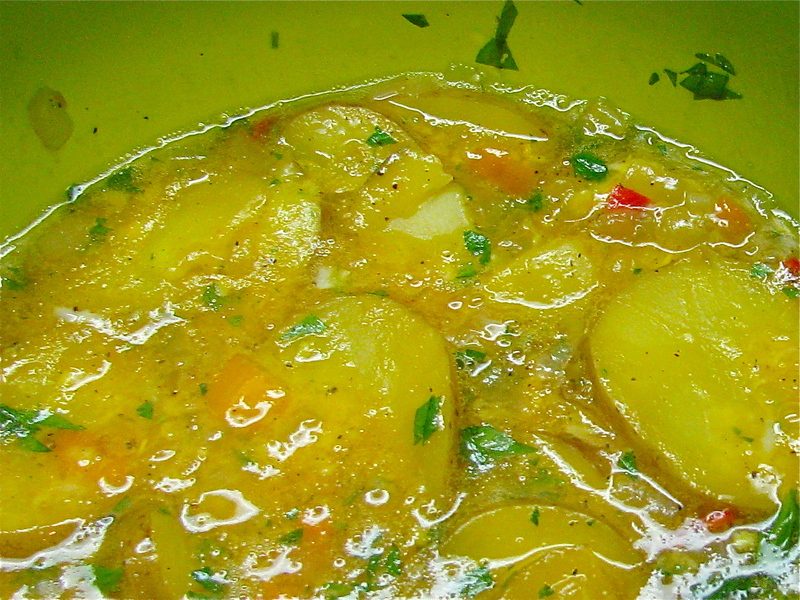 Add the potatoes and salt, stir well, reduce the heat to medium low, cover and cook for 20 minutes until the potatoes are soft and the slices easily break in half. Stir every five minutes during the process. 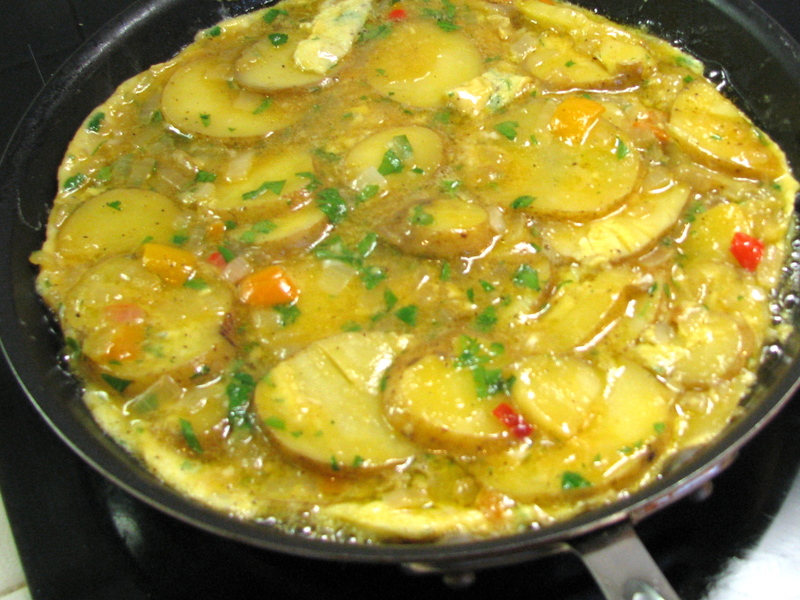 While the potatoes are cooking, lightly whisk the eggs, milk, and the parsley or basil in a mixing bowl. 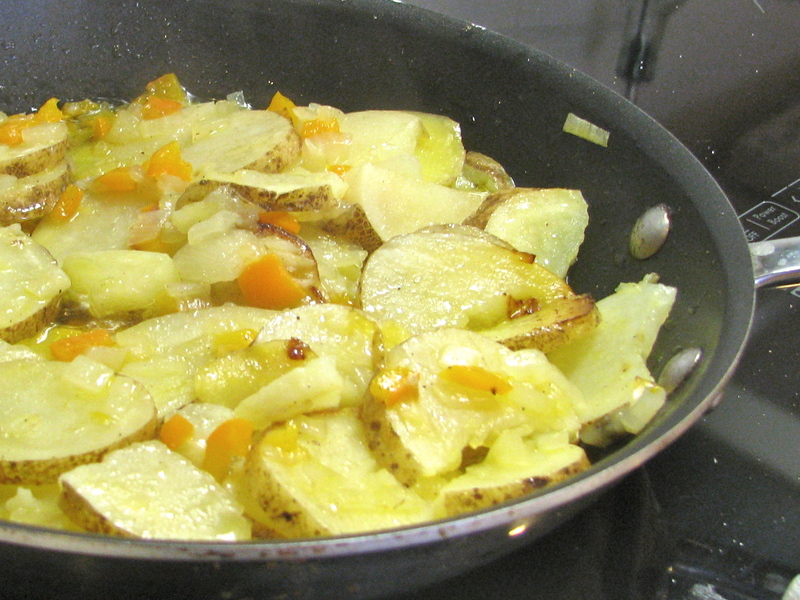 With a slotted spoon, remove the potatoes from the skilled and mix with the eggs, leaving as much oil in the skillet as possible. Let the mixture sit for five minutes – this will partially cook the eggs. Put the mixture into the skillet over medium heat, using a spatula to loosen the sides while it cooks. When the mixture has “set” and little or no loose liquid remains (about 7-8 minutes), put on your oven mitts, take the skillet off the heat, put a plate on top and flip the tortilla onto the plate. Add a little oil to the pan and slide the tortilla back into it. Continue cooking for about five minutes. Slide the finished tortilla onto a serving plate and enjoy. Cut as you would a pie. Place the leftovers on a plate in the kitchen and cut into thin pie-shaped pieces. Everyone will nibble on them throughout the day, wishing all the while that they could become a Bravado chef also.